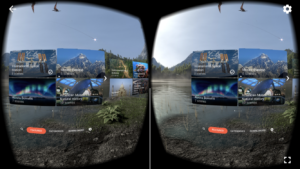 For reviews of VR apps, software, equipment and more. 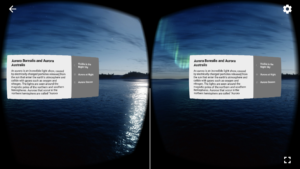 For my review, I will be examining the New York Times VR app (NYT VR). The app, created by the New York Times, allows the user to view all of the 360 videos the site has published in one place. NYT VR can be downloaded free of charge on iPhone, Android, and Samsung Gear devices. First and foremost, the best feature about this app is that it provides hundreds of high-quality VR videos to the user. The New York Times posts some of the most immersive, story-driven videos that VR has to offer, so it is great to be able to browse through them in one place. In terms of design, I enjoyed how it displayed a large image of the video with a short description underneath it. Scrolling down to view all of the other videos was fluid. When selecting a video to watch, the app smoothly transitions to the video’s page where it offers the user to either play or download the video. 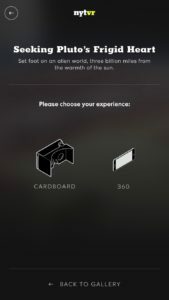 I thought the transitions were excellent and made me believe that this is one of the most well designed apps for viewing VR videos. Another feature of NYT VR that I liked was the on-screen option of selecting your viewing experience. Before the video started playing, you had to choose if you were watching it as a 360 video or through Google Cardboard or any other device. I thought this was better than YouTube’s system of playing it automatically in 360 and having to select Cardboard at the bottom of the screen. Another feature I enjoyed about this app was the countdown before the video started. While the countdown was only 3 seconds, it was nice to be given some time to put the phone in my viewer before the video started. Often times when watching videos on the YouTube app, I miss out on the first few moments of the video because I am adjusting my phone into my viewing device. Finally, for those who can’t get enough of VR video, the app offered to notify the user whenever a new NYT VR video is posted! While I thought the app was excellent for the most part, that doesn’t mean there isn’t room for improvement. Although I did enjoy scrolling through to see all of the videos, I would have liked a search function to be able to find a specific video more efficiently. In addition, I believe a category section could be added (Ex- Science, Documentary, etc.) to help the user browse and select their desired video. When watching videos, I had issues when attempting to jump ahead. Rather than go to the timeframe I selected, often times the video would simply continue to play at the time I was already at. The NYT VR app is a great choice for anyone looking to view high-end 360 VR videos with unique stories. The app is excellently designed and offers features such as the viewing selection and countdown that improve user experience. 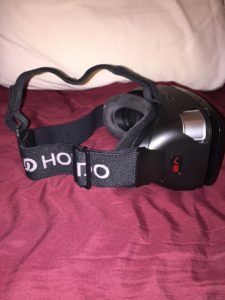 The V2 Headset is a virtual reality visual headset made by Homido. This headset was one recommended to me by our own David Stephenson. I had no experience in the world of virtual reality before stepping foot in this class. The only thing I had ever seen for virtual reality was either through gaming or what had just started to be popular with Samsung. Having no knowledge, I went off of David’s recommendation. Looking for the headset I searched on many websites including best buy, eBay, and amazon. Each market had this particular headset for around $79.99 with the exception of amazon having used ones and also a few deals. For those of you who are like me and don’t know much about VR headsets probably will do some digging and find that this headset does end up being on the higher end of prices for headsets. But sometimes the quality of items will come for that higher end price. One thing I immediately have to say is great about this set right from the start is that it has straps to hold it onto your head and keep you from holding it. 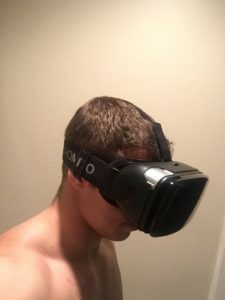 It has one primary strap going around the back of your head and a secondary strap that connects from the top of the device to top of the primary strap over your head. Both straps are individually adjustable and allow a comfortable fit. 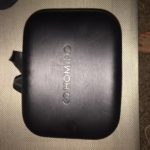 Another great pro this headset is able to be used will nearly every smart phone out there including the iPhone 6 plus (which is the phone I have and use with it), unlike the Samsung Gear VR headset that don’t have the ability to use every phone just the specific galaxy and note phones (which both work in the Homido V2). A third big pro I found in the Homido V2 is that it has little gaps on the side of the area you place the phone that allow you to plug headphones which many of the other VR headsets on the market don’t actually have, they either come completely sealed off when closed or have their own built-in headphone plug that if you have upgraded to say an iPhone 7 or have a phone similar you don’t have the headphone jack for that to work with. 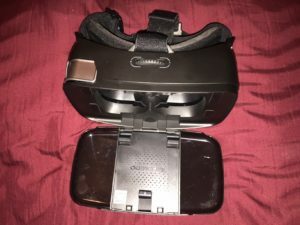 The final pro I have found in this headset is there is the button on the top right of the device that allows you to tap the screen and control some of the features that 360 or VR videos will have set up on the display screen. There’s really only one main con I could say that Homido could improve with this product and that would be its ability to have an even better focus on the videos you would try to watch in it for those people whose vision isn’t as good as the average person or have it big enough to be able to wear your prescription glasses in them. To use this headset is very easy it comes already together straps on and everything. All you need to do is open the front of the headset that is held by a magnet. You will then place your smart phone into the clips. Find the video you’d like to watch and have it set up. Then finally, place the headset on your eyes, adjust the straps until it fits well without holding it, and presto you’re good to go and watch all the videos you’d like! I hope my review of this headset was helpful and you will enjoy it as much as I do. Fyuse is an app that allows someone to create 3D images. Developed by Fyusion, Inc. the app is iOS compatible, 81.9mb to install, and receives regular updates. The app is free. Before I go into my experience with the app I want to preface this review with the fact that I was operating it on an iPhone 5s and that some of the issues I faced may be in part due to the older phone processor. When the app is first opened, it takes you through a brief tutorial that showcases what is possible with the app. The app then makes you sign in before allowing you do any pictures yourself. I am not a fan of having to sign up for app use but you can pick to sign in with Facebook, email, or twitter. Once signed in immediately you recognize that this app is a social experience. You can have friends and share pictures, there are trending and recent uploads pages but the coolest feature was the “photos like yours”. This analyzed what the picture was of and gives the viewer other pictures the same thing. The main purpose of the app is to take 3D images, images that have one focal point and allow for the viewer to freely rotate around the subject. When working, the app is super cool and brings a whole new dimension to what is being looked at. The image captured can be posted to the app site, Facebook, Instagram, and Twitter. The photo can also be exported as a video, live photo, and animated GIF. The app also allows for image editing like filters and cropping and allows the addition of text and stickers. I was, and still am super impressed with all the things this app can do and think you should check it out but I am going to go through some of the issues I ran into. At random the camera would not work and would just say “error” but this was fixable by going to the profile page and then back to the camera. Felt like a lot of social media crap was cluttering the app but that’s a personal thing. Easy to understand difficult to operate super well. Can feel like a video of you walking around something and not a 3D image. Get this app and play with it! It is free and a lot of fun. Despite the issues it has there are a lot of positives and potential. This is one of the coolest way to show something off and I expect it to become more and more popular. 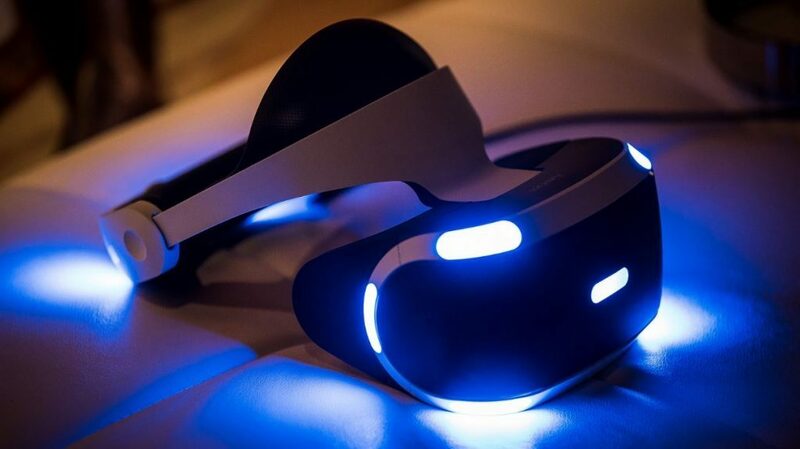 In October of 2016, Sony released the PlayStation VR, a virtual reality headset designed to work exclusively with the PlayStation 4. 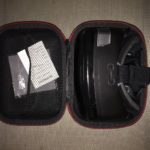 As the first VR headset to be designed for a gaming console rather than an expensive computer gaming rig, it garnered the attention of many gamers interested in VR. I purchased my PSVR in December of last year. I’ll admit, I was a little hesitant about it at first, fearing that I’d just dropped almost $500 on a gimmick that wouldn’t last long. That fear was extinguished within minutes after setting up the headset and playing my first VR game. Now, after owning the headset for almost a year, I don’t regret a thing. Upon putting on the headset for the first time, I was pleasantly surprised by just how comfortable it was. Both the strap and the portion where your forehead rests against the headset are covered by a soft, thick, foam-like material. It’s even pretty sweat-resistant and easy to wipe off in between uses, which is great for having friends over to try out the headset. Beyond that, the headset has 2 buttons and one dial that allow you to adjust it to your perfect fit. Compared to its competitors, the PSVR is a bit heavy. 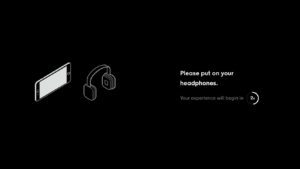 However, the weight is perfectly balanced, with much of the headset’s weight being in the strap, allowing for the front of the headset to hang comfortably in front of your eyes. My only complaint is that the cables that connect the headset to a PS4 are a little thick and cumbersome. However, with the new model of the PSVR, the cabling is more streamlined and easier to avoid. Design-wise, I personally think the PSVR is the best looking VR headset on the market. The high contrast black and white color scheme, along with the blue LEDs and smooth, curved edges all come together to create a beautiful, futuristic-looking headset that wouldn’t look out of place on the head of a Daft Punk member. 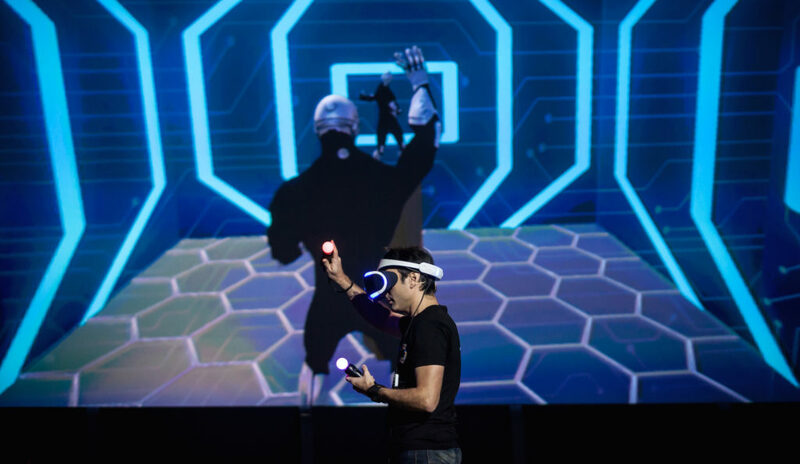 The PSVR uses three different control schemes: The standard PS4 controller, PS Move controllers, and no controller at all where the player controls their character by moving their head. For the majority of games, I highly recommend using the PS Move controllers, as the motion control greatly enhances the immersion of the PSVR. In fact, many games require that you use the Move controllers. While the Move controllers may not be as intuitive as the Oculus Touch controllers (which I believe are the perfect controllers for virtual reality), they’re still solid, comfortable controllers that are easy to use. Gameplay on the PSVR is fantastic. Games run smoothly and look great. 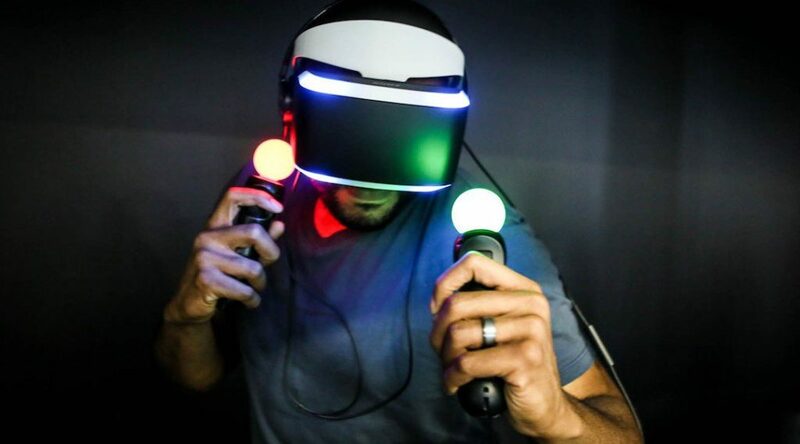 Some players have complained about glitches with the controls and motion-tracking, but I haven’t personally experienced any issues.The resolution isn’t as high as in the Oculus Rift or HTC Vive, but I don’t find it to be a particularly remarkable difference, especially when the significantly lower price-point of the PSVR is taken into account. The PSVR has an impressive library of games and experiences. 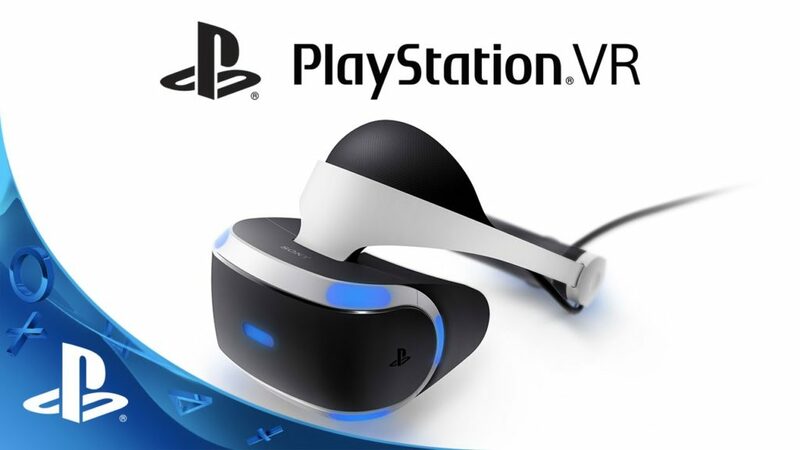 Exclusive titles such as Resident Evil: Biohazard, Until Dawn: Rush of Blood, Skyrim VR, and Doom VR really make the PSVR stand out amongst its competition. Additionally, titles like Fruit Ninja can appeal to more casual gamers. Personally, Resident Evil is my favorite game I’ve played on PSVR. It’s truly immersive and terrifying. 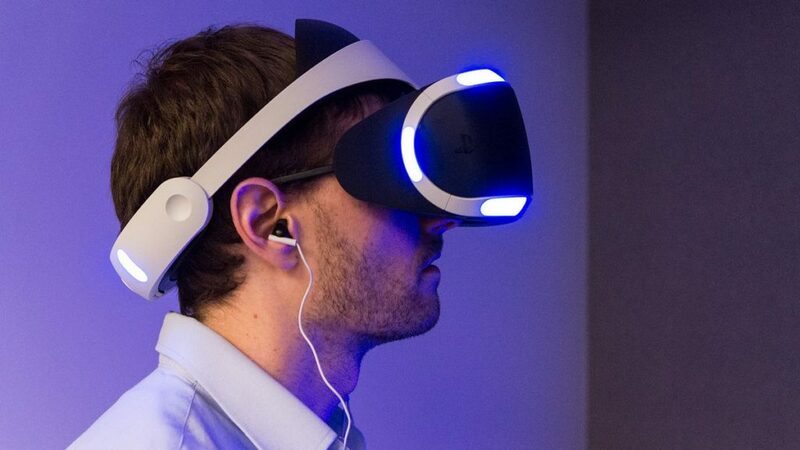 In conclusion, I think the PlayStation VR is a fantastic headset. It’s comfortable, the controls are great, and it has a great library of games. Beyond this, the price point simply can’t be beaten right now. When I got my headset a year ago, it was $400 plus about another $100 for the PS Move controllers and PS camera. Now, Sony has released bundles with the headset, camera, and Gran Turismo for $300, or bundles with the headset, camera, the Move controllers, and either Playstation VR Worlds or Until Dawn: Rush of Blood for $350. 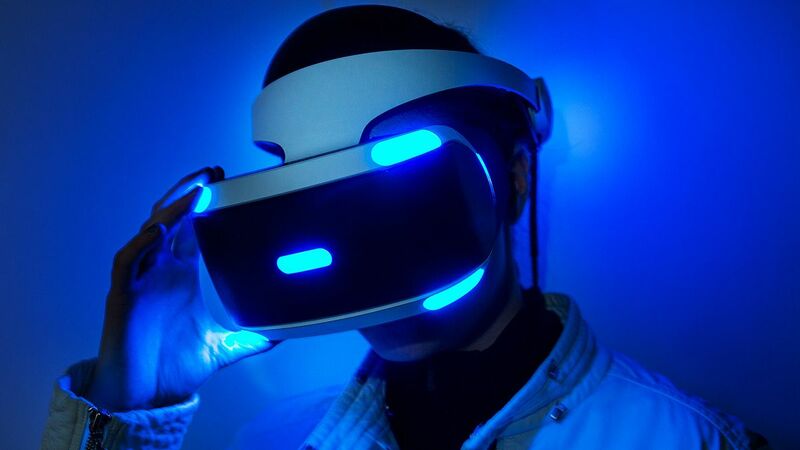 For the millions of people that already own a PS4, the PlayStation VR is an awesome and affordable virtual reality headset. 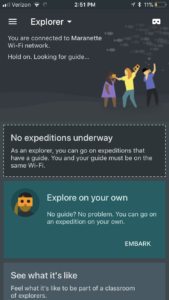 The Expedition App from Google Play is a VR app that users can use to explore places all around the world, outer space and even dinosaur times. This is a free app available on Android and IOS. It gives the viewer three options of being a guide, being an explorer or seeing what it’s like from a classroom experience. To be a guide, it was a long and complicated process, in which I did not even follow through with because of all the downloads and confirmations that went along with it. that took me over 25 minutes. If I were a designer for this, that would be something I would change. For the explorer choice, it was probably my favorite option due to it’s ability to let the viewer control where they go. It allows you to go out on your own and pick the adventure you want too, which there are plenty of options to choose from. For the classroom experience, it puts the viewer in a classroom setting in what looks like an elementary school and is guided by a teacher and picks the adventure for you. From the jungle, to space, to Paris and more, it also puts a point of interest, showing the viewer arrows where to look and what is the most interesting part of the scene. While this was enjoyable, the scenes changed way too quick and barely let me view the whole scene. After reviewing a few sessions of this app, and reading that it is more for educational use, I would completely agree. Even on a prior review and explanation of the app on Google Play, it says that it is “Built for the classroom and small group use.” Even with the classroom setting, while having a tour guide, explaining different scenes and points of interesting, it is way too fast for a viewer to get a proper view of the scenes. The biggest disadvantage of the experience of being a the explorer mode is that all the pictures and scenes are still. For scenes such as the Aurora Borealis, a similar light show to the northern lights but in Australia, or the dinosaur scenes, it would have very beneficial to have the lights flickering or have dinosaurs roaming by the viewer. Instead, everything is still. I think one of the biggest advantages of this app is how detailed and real the scenes are. There are also so many adventures to choose from I never felt like I was limited to just a few different options. Overall, I could see myself using this app without pursuit of educational purposes but rather curiosity of all the places this app has to offer to explore.